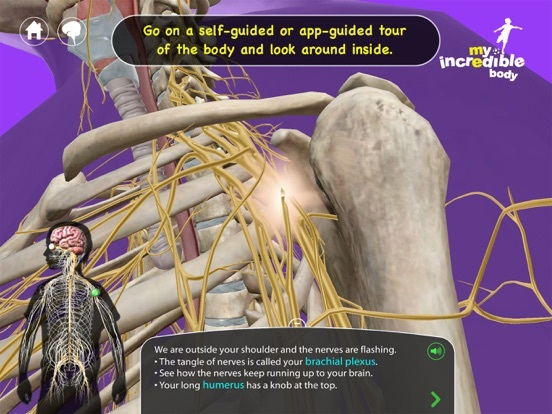 Get up-close and personal with the human body, exploring all of its parts, seeing how they're all connected, and absorbing key information about each body part at the same time in this highly interactive and informational app. Discover the human body, region by region. 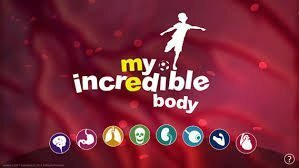 My Incredible Body gives kids a chance to explore parts of the body such as the brain and nerves, muscles, the skeleton, and even the kidneys and urine. In each section, kids get to see a model of that particular part of the body, with the ability to unpack it layer by layer. 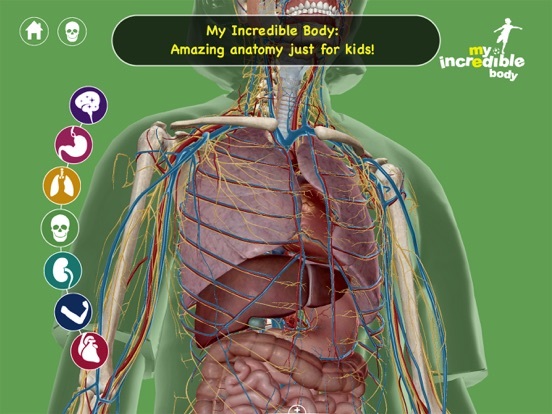 Short informational passages provide kids with descriptions of the major body parts, as well as fun tidbits of information about how the parts of the body work together. After they’ve been through all of the informational passages, kids can learn even more about a particular part of the body by watching short videos. When they’ve been through it all, kids will come away with a thorough understanding of their bodies and how they work. 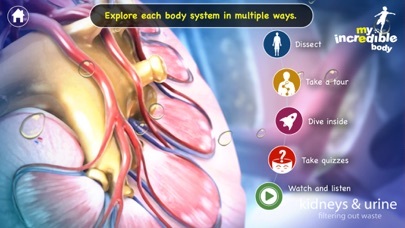 The streamlined design helps kids navigate through the different parts of the body. On the main screen, they’ll see icons designed to represent all of the major body parts and regions featured within the app. 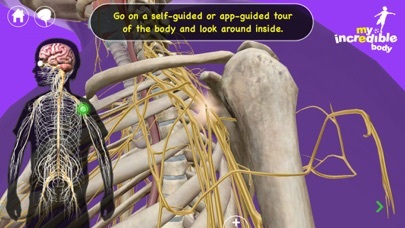 Selecting a particular body part will bring up information about that part accompanied by a 3D model that helps kids understand the information in the informational passages. While the icons used within the individual sections could use a bit more clarification, kids don’t necessarily need to know what they mean in order to discover the information they contain. All of the information about the body has been presented in kid-friendly passages, making it easy for kids to understand what might usually be perceived as extremely complex information. Key words are highlighted to draw kids’ attention to them. A narrator also reads each passage aloud, putting emphasis on key facts and phrases. While the amount of information is extensive, kids won’t feel overwhelmed as they take it all in. That’s because they have the 3D models to help them make sense of it all. Even though the passages contain fun bits of information about the human body, most kids won’t find themselves entertained by it. However, they will enjoy playing around with the 3D models, adding and taking away parts of the body to discover how it’s all put together. 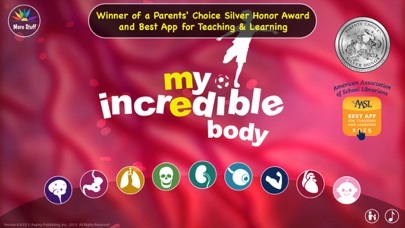 My Incredible Body packs the content of a textbook chapter on the human body into a single app. Then it adds informational videos and the interactivity of 3D models, allowing it to reach kids more than a traditional textbook could dream of doing. 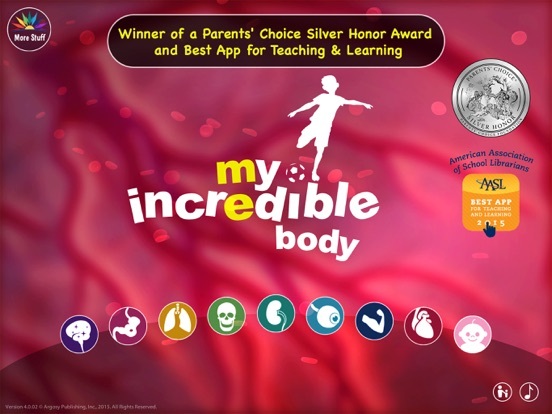 With no settings or info screens, all kids can do once they open My Incredible Body is learn about the human body. All information contained within the app has been written with kids in mind, focusing on kid-friendly language and sticking to information that’s appropriate for kids. 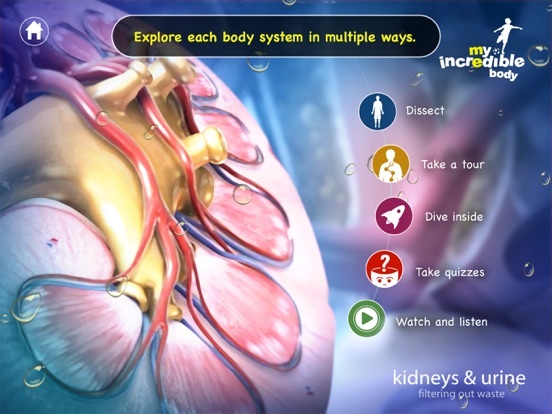 Parents don’t have to worry about any iffy facts about the body, although some boys may find themselves migrating to the kidneys & urine section more than the others where they can learn about how much pee they can hold before they have to go.